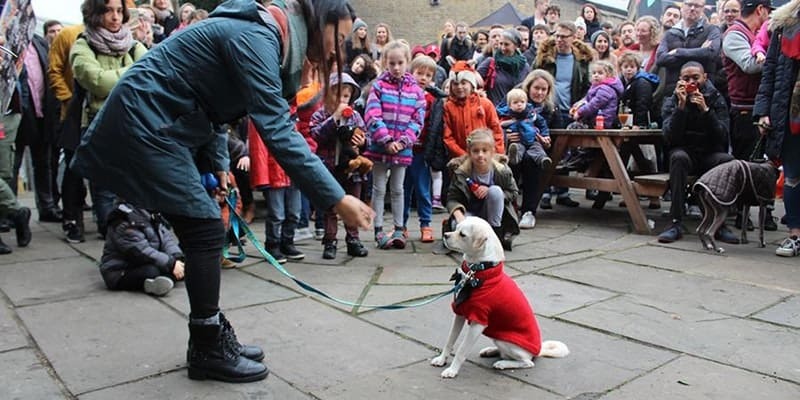 Forget the 12 days of Christmas, how about the 31 days of Christmas…December is shaping up to be THE month for London Dog Events with a whopping 17+ events in our December 2017 Events Agenda For London Dogs! And of course it wouldn’t be December without a pup ‘pawty’ or a few. Fest of Chihuahuas kicks of the festive fun with their Christmas Spectacular on 3rd December and although only Chihuahuas will be able to take home the Christmas crowns of Kind and Queen Chi, other small breeds are invited to the event. 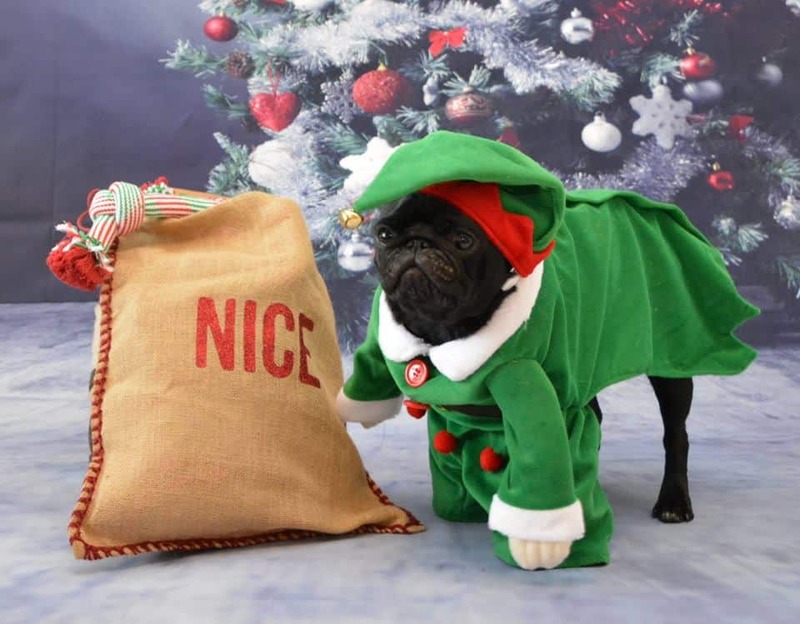 Keeping up the trend for all things pug, London Pugs get their own Christmas shindigs with the Pugs & Pals Christmas Party ‘Pug Le Chateau (9th and 10th December) and the Christmas Pug Cafe (17th December). These pug events sell out quicker than Christmas Jumpers so get your little pug paws on a ticket quick! Talking of Christmas Jumpers, there is now what could possibly be our favourite day of the year…Doggy Christmas Jumper Day on 10th December with a World Record Attempt for the most dogs in Christmas Jumpers! If by the end of the month your pup has had a few too many Christmas treats, you can walk it off at Ham House and Gardens who will be opening the gardens to pups for the first time in 300 years for their Twelve Dogs of Christmas Winter Walkies from 26th December. Then see 2017 out in dog friendly style at the Dog Friendly NYE Party Round Little Nan’s in Deptford on 31st December! 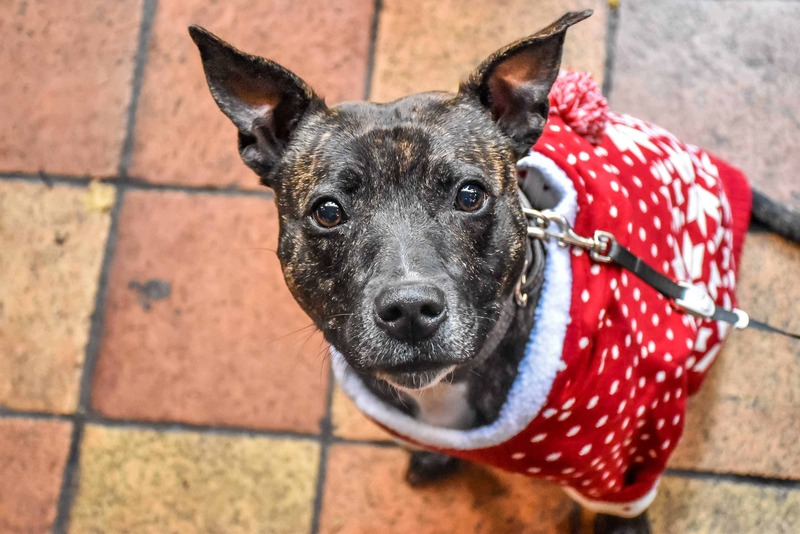 Add in plenty of festive pooch parades & pup-ups, cool canine charity events, a film festival and even a Grotto for doggos and looks like December will be keeping London hounds and humans busy this month! We wish you lots of festive four-legged fun at all these fur-bulous events, just click on the calendar links below for the scoop on each event! Celebrate Christmas in true Canary Woof style at our inaugural Santa Paws Brunch, We are planning a fun morning which is guaranteed to get tongues and tails wagging! Compliments of Metro Bank all dogs get to dine for free (*terms apply)Rumour has it that Santa Paws will be popping in (for a large pawtini or two) carrying a large sack full of gifts & prizes for all the good doggies, while spreading the good word of All Dogs Matter a wonderful local charity who do amazing work in re-homing lots of less fortunately pooches.We are once again excited to welcome, the celebrated nutritionist, behaviourist, columnist and radio/tv personality, Anna Webb who has created a jaw drawling doggy menu of fresh, natural ingredients. 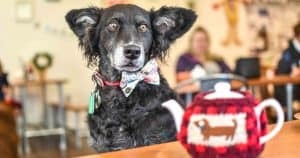 This exciting menu includes ‘Barking Berry Boost’, ‘Growler Veggie bites’ and ‘Hounds on horseback’ to mention a few. The Straight and Narrow are of course also offering an equally exciting human brunch menu.Don’t forget to wear your best Christmas outfit to enter our Tinsel Tails competition. If you want your photo taken with Santa Paws, you better be good! 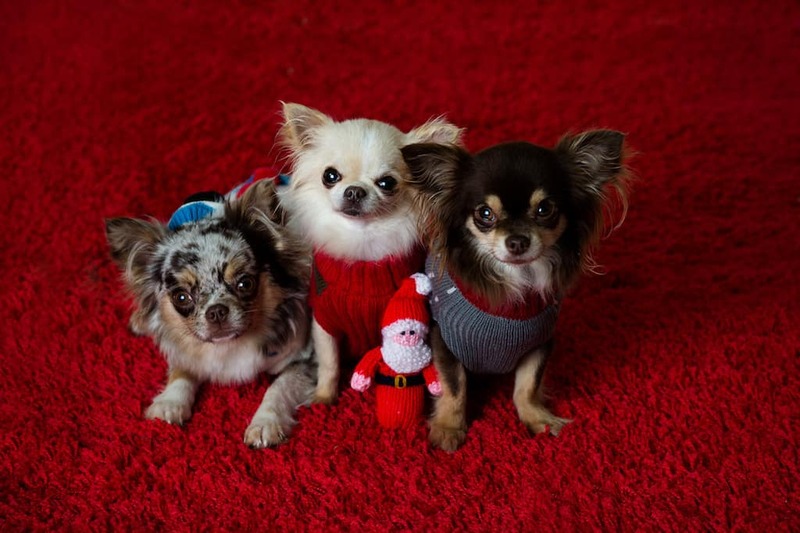 Internet sensations Rocco, Rhapsody and Indie will welcome 1000 fellow chihuahuas to the biggest ever canine christmas party. 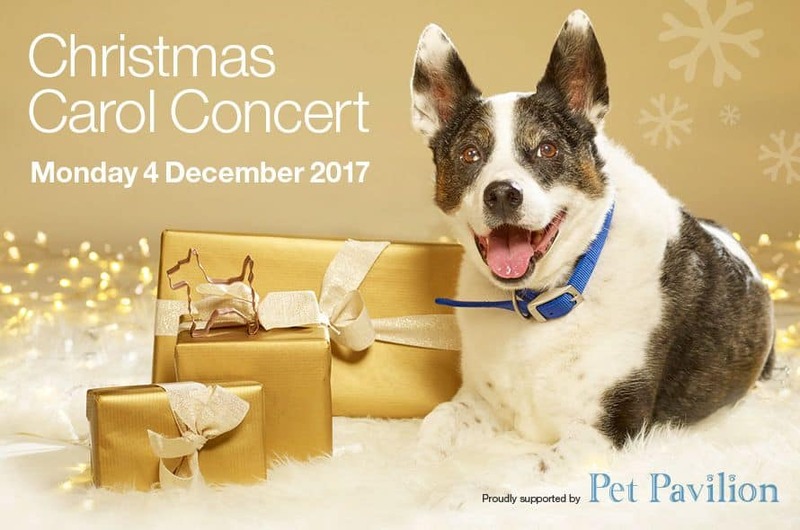 Pet owners from all over the UK and abroad are bringing their pampered pooches to act as Santa’s little helpers on Sunday 3 December at Royal Windsor Racecourse . 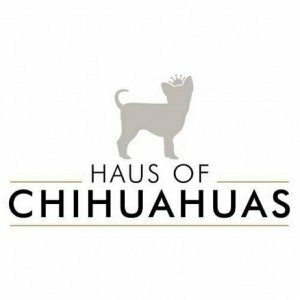 Fest of Chihuahuas, thrown by dog boutique and event organizers Haus of Chihuahuas, will combine canine fun and festive family cheer. Among the many attractions will be Santa Paws Grotto – hashtag CHI’elfie!, a huge Christmas hits and carol singalong session with local singer Tiger Lilly, a festive Christmas market selling trinkets and treasures for humans and their pets, indulgent hot food and drink, a doggy wedding shack for pets to exchange bow wow vows with their loved one and a pet photo booths for a once in a lifetime Christmas pawtraits. 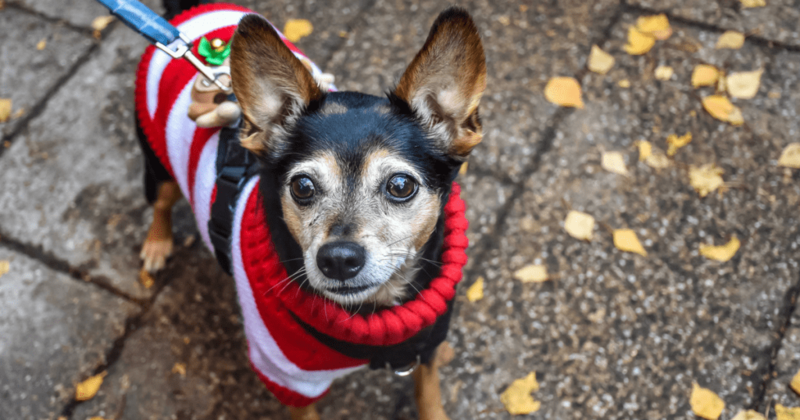 In between shopping, singing and a festive toast, visitors will be able to watch special chihuahuas Christmas themed performances with the U.K’s top chihuahua agility dog and Crufts favourite Lucky the Chihuahua. Chihuahuas are invited to enter Chi Idol, the canine equivalent to X Factor with categories such as Smallest Dog, Biggest Attitude, Matching Pairs – Christmas jumper edition, Dapper Dog and the Chihuahua Rescue UK sponsored Rescue Reward. The ultimate champion Chihuahuas will be crowned King and Queen of the festival in the Royal Windsor Racecourse Winners enclosure. The event is being held in aid of Chihuahua Rescue UK and aims to raise money and awareness. 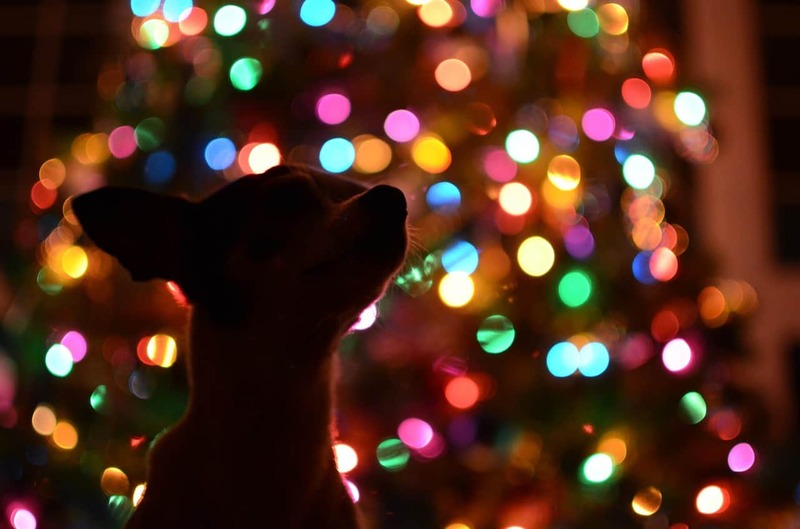 Fest of Chihuahuas – Christmas Spectacular is open to chihuahua owners and also anyone who admires them. Lovers are welcome to spectate and have unlimited cuddles with the cutest dogs in the world! Tickets available on Windsor Racecourse website or at: www.billetto.co.uk/e/fest-of-chihuahuas-christmas-spectacular-tickets-221499. Book in advance to avoid disappointment. Event runs 11.30-5PM Sunday 3rd December. Handful of tickets will be available on the door. Chihuahua, Chihuahua crosses and small toy breeds welcome. NB: other breeds will not be able to enter Chi Idol but can take advantage of all the other fun activities available on the day. 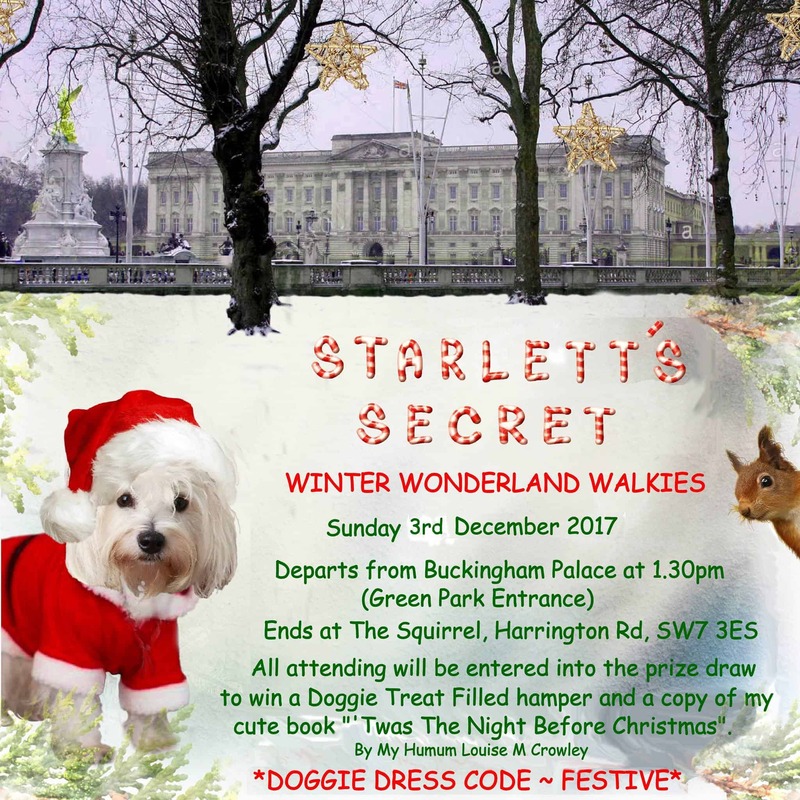 Join London’s very own Starlett for a Secret Winter Wonderland Walkies on Sunday 3rd December, starting at Buckingham Palace (maybe the Queen’s corgis will join the walk) and ending at dog friendly healthy eatery We Are Squirrel in Kensington. Everyone attending will be entered into a prize draw to win a Doggie Treat filled hamper and a copy of the book ‘Twas The Night Before Christmas’ by Scarlett’s human – Louise M Crowley. Doggie Dress Code…Festive of course! We welcome you to join us on Monday 4 December, from 7pm for our Christmas Carol Concert. Come along to sing carols and celebrate Christmas in the beautiful surroundings of St Luke’s Church, Chelsea. Wrap up warm and enjoy a festive evening, joining the Home’s family and friends, with mulled wine and mince pies for everyone. There will also be plenty of our canine friends to welcome you on the night in our Doggie Guard of Honour. We ask that you please leave your own four-legged friends at home on this occasion. Get into the festive spirit and buy your tickets now. We are delighted to invite you to the Teddy Maximus Pup-Up at Kyra Loves, 86 New Kings Road, Parsons Green London. Come and browse our latest collections, including our cosy dog beds, saddle bags and NEW lambswool dog jumpers exclusively available at Teddy Maximus! Bring your pooch to try out our accessories, whilst they enjoy complimentary Pawsecco tasting! We’ll be also be offering bespoke Winter Coat fittings to ensure your pooch is wrapped up warm this season! 9th December: 10am – 6pm – live personalisation instore! The most glamorous event in the doggy calendar, Tinsel and Tails, returns on the 5th December 2017. 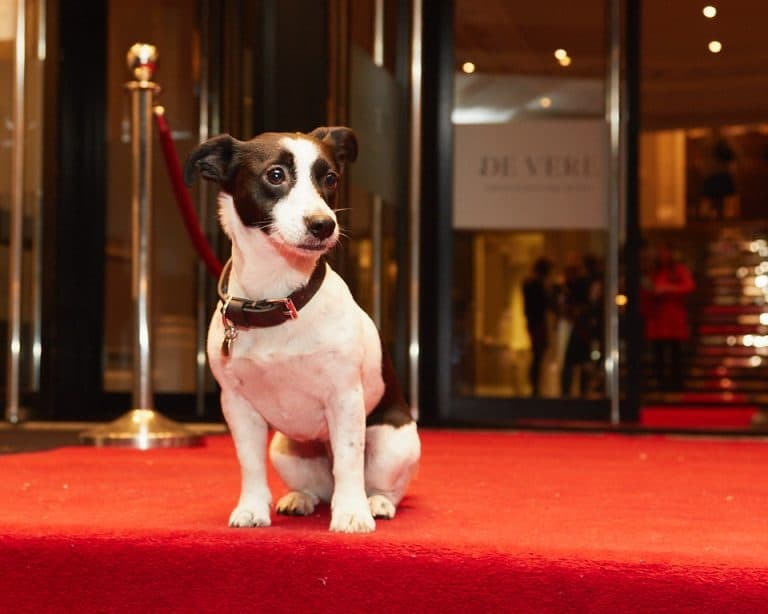 Held at The Grand Connaught Rooms, this dog friendly Christmas event is the most unique and fun way to support the animals at The Mayhew over the festive period. Guests will be treated to an exclusive black tie evening like no other. Our two and four legged diners are invited to join us on the red carpet followed by a fabulous three course meal, entertainment and the chance to win some amazing prizes in our auction and raffle. Whether you choose to bring your dog or not, Tinsel & Tails is the perfect opportunity for some canine companionship! 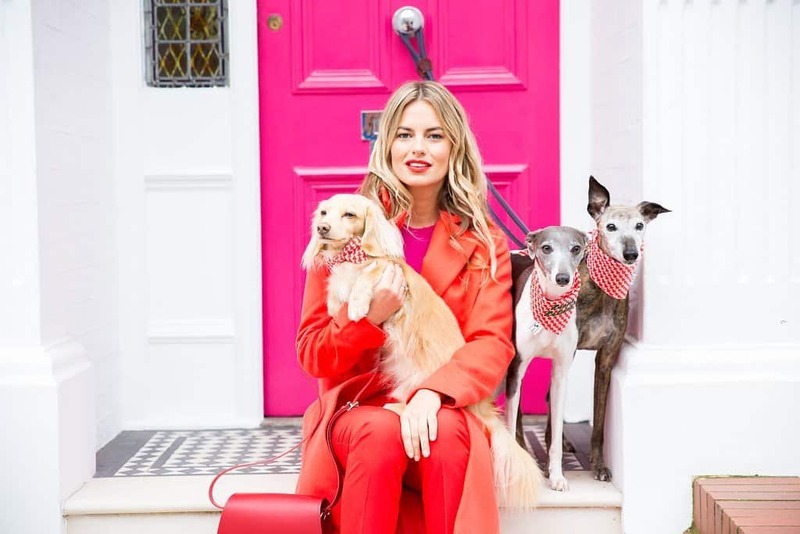 As the old saying goes ‘Dogs are for life and not just for Christmas’ and that’s just what Christiana Hines, owner of Hampstead Hounds is trying to reinforce by holding a special ‘drop in’ fundraising event to coincide with the run-up to Christmas. The dog-friendly coffee morning event is in aid of All Dogs Matter a charity that helps rescue and rehome dogs in the London area. The special fundraising event will take place on Saturday 9th December 2017 at the popular dog-friendly Chamomile Café on England’s Lane, London NW3 between 7.30am-9.30am. Complimentary light morning refreshments will be served to invited clients and those who drop-in during their early morning dog-walk. be eaten on the big day itself. There will also be merchandise for sale, a bucket collection and dog goodies supplied by Beautiful Joes. 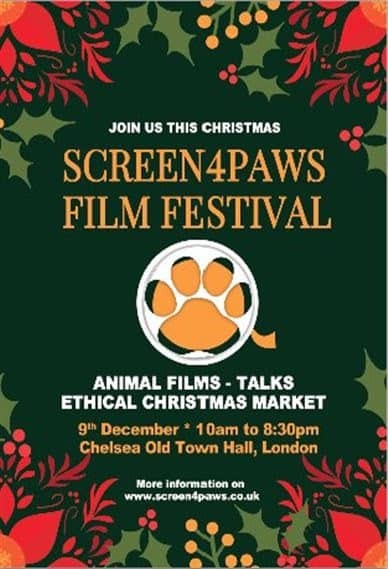 Screen4Paws Film Festival, the first film festival to focus exclusively on animals is coming to London’s Chelsea Old Town Hall on the 9th December! The Screen4Paws Film Festival will open its doors to all animal lovers, adults and kids, vegans and non-vegans. From the amazing Ethical Christmas Market to the inspiring documentaries’ screenings such as Blackfish and Lion Ark, the festival will stimulate joy just as much as serious consideration for our animal friends. Topics discussed will include animal testing, veganism and animal cruelty with talks by Emily James from Animal Free Research UK and Isobel Hutchinson from Animal Aid. Green World TV presenter Anneka Svenska will also have a significant presence at the Screen4Paws Film Festival as she will not only be hosting the talks but also will also be advising on how to become a campaign filmmaker alongside actress and filmmaker Carla Fraser. The Screen4Paws Film Festival’s mission is to improve the lives of all animals by not only raising funds for animal charities but also by raising awareness about the odds that many animals face on a daily basis and by stressing the importance of documentaries for the animal kingdom. ‘Only if we understand, will we care. Only if we care, will we help. Only if we help shall all be saved.’ Jane Goodall (British primatologist and UN Messenger of Peace). Tickets are just £6 for the whole day can now be bought from here. Fireplace, Christmas trees, Champagne, Christmas Cookies, mince pies… we will have it all! 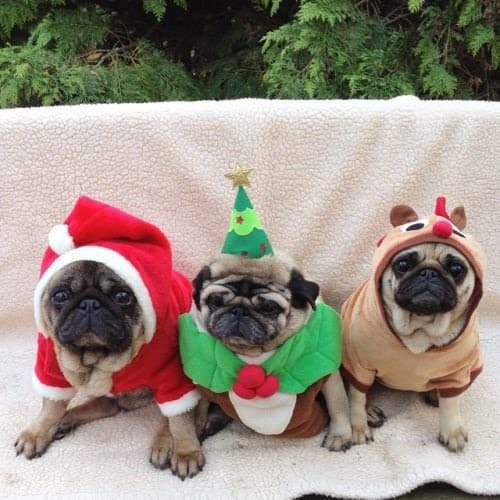 Come and join us on our very own Pugs & Pals Christmas Party in “Pug le Château”. In collaboration with 4th floor studios, we will make you feel like you just entered a flamboyant French Château Christmas experience. During normal Pug Le Château hours (10am – 6pm) on December 9 & 10th, we will accept dog owners & lovers. Pug, pug crosses, french bulldogs and french bulldog crosses will get through the door. 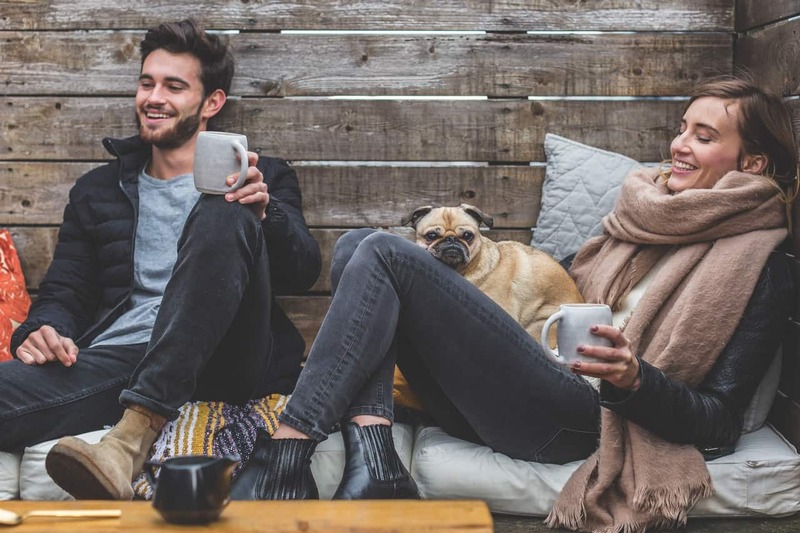 Come and enjoy the company of our furry friends at the Pugs & Pals Christmas Party over a cup of tea, coffee, cocktails or mulled wine. As usual, a wide arrange of beverage and bakery options will be available, for both humans and dogs. Christmas attire for both humans and dogs is highly encouraged! Entry: £5 for dog owners, £10 for dog lovers per session. 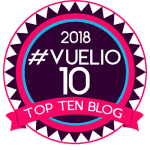 ​Spaces are very limited – Make sure to get hold of your spot! Event text and photo(s) by the Event Organiser. 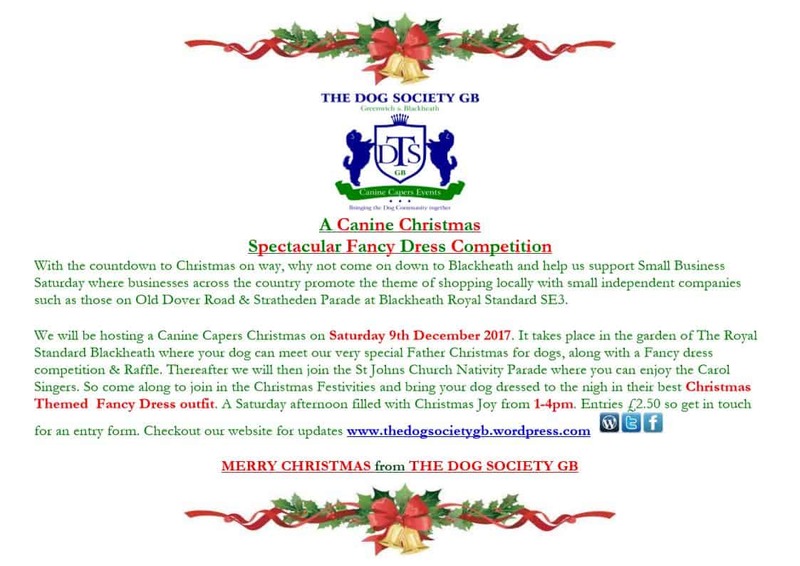 The Dog Society GB will be hosting A Canine Capers Christmas – Spectacular Fancy Dress competition at The Royal Standard Blackheath SE3 in the front Garden area. So come along and join in the Christmas Festivities. Enjoy the Nativity & Choir across the way at St John’s Church, Enter our Raffle & win a prize for you & your dog! 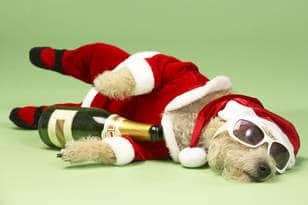 Go ahead get festive you and your canine friend with some mulled wine & mince pies and off course treats for your dog. Get your loveable Canine friends best Christmas outfit and enter our Fancydress competition and join the parade. FUN! FUN! & more FUN! Important Message! The Registration date closes on Friday 8th December 2017. You will not be able to register your entry for the fancydress competition on the day. Please email thedogsocietygb@gmail.com for an entry form. It is time to get festive with your furry friend. Come join us on the 10th of December for Doggy Christmas Jumper Day, the most adorable event of the year. It is time to get festive with your furry friend. Come join us on the 10th of December for Doggy Christmas Jumper Day, the most adorable event of the year. Together we can support Save the Children and attempt to win the World Record for the most dogs in Christmas Jumpers. So dust off, pick up, or snaz up your dog’s Christmas jumper and meet us there for Doggy Christmas Jumper Day. 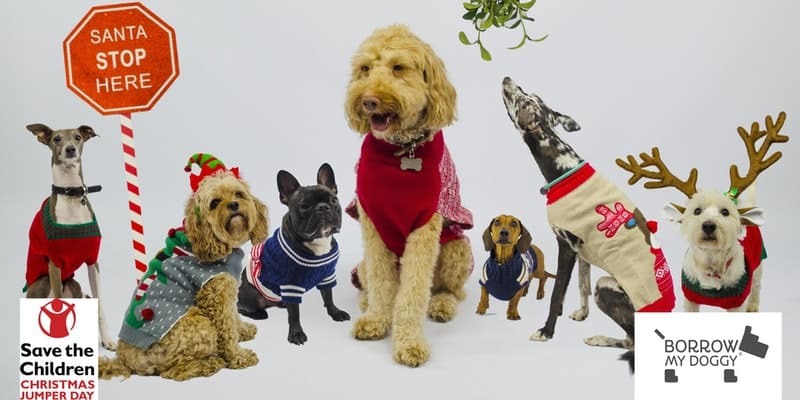 What: Save the Children and BorrowMyDoggy have partnered to host a world record attempt for the most dogs in Christmas jumpers! Join us to support this lovely charity and have a fun day. How: Let your pup show off their festive style in their Christmas jumper. Come early or stay late but make sure you are there at 2:30pm for the world record photo. Snacks and treats provided. Bring your pup to join the fun at Sylvan Post Festive Pooch Parade dog show for their 2nd annual Winter Fete! Categories include most talented pooch, top paw shaker and most Christmassy canine. No show experience is necessary – it’s all in good fun! Every participant gets a prize and certificate – the winner receives the coveted golden bone for their leash! Competitors can just rock up and do not need to book a ticket. If you’d like to enter your dog it is one ticket per dog – there are only 10 spots. We're having a Christmas party - for dogs, by dogs. We're going to have lots of kibble-nibbles and party games including a doggy photobooth and goody bags. 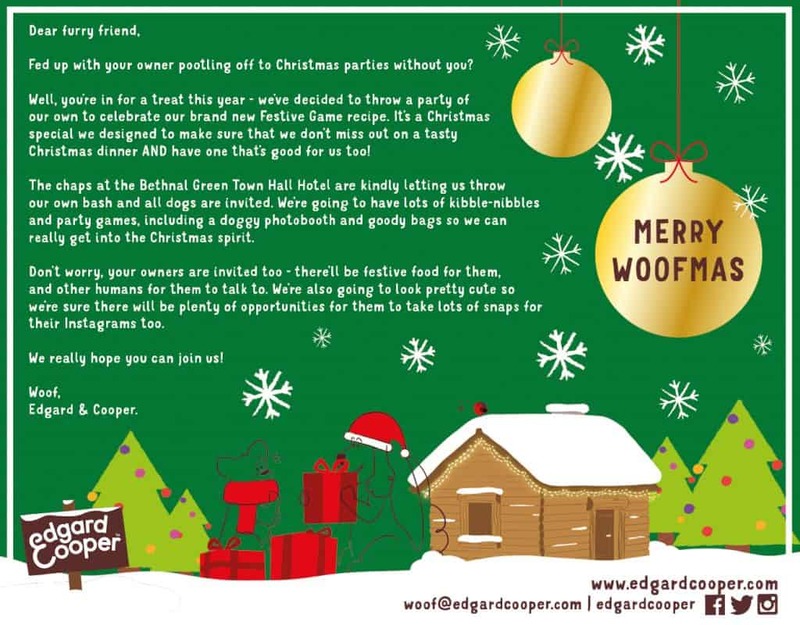 We’re having a Christmas party – for dogs, by dogs. We’re going to have lots of kibble-nibbles and party games including a doggy photobooth and goody bags. It’s going to be barking brilliant and we’d love for you to come! RSVP to guarantee your place to: emmai@taste-pr.com. Shane’s on Canalside is hosting more Shane’s Dog Day Out events, centred around Shane’s new 3 course dog menu, which comprises of only natural ingredients, thoughtfully combined to get tongues and tails wagging. Overlooking River Lea in Hackney Wick, Shane’s Canalside offers a pawfect vista, and champions our canine companions being ‘dog-friendly’ inside and out. 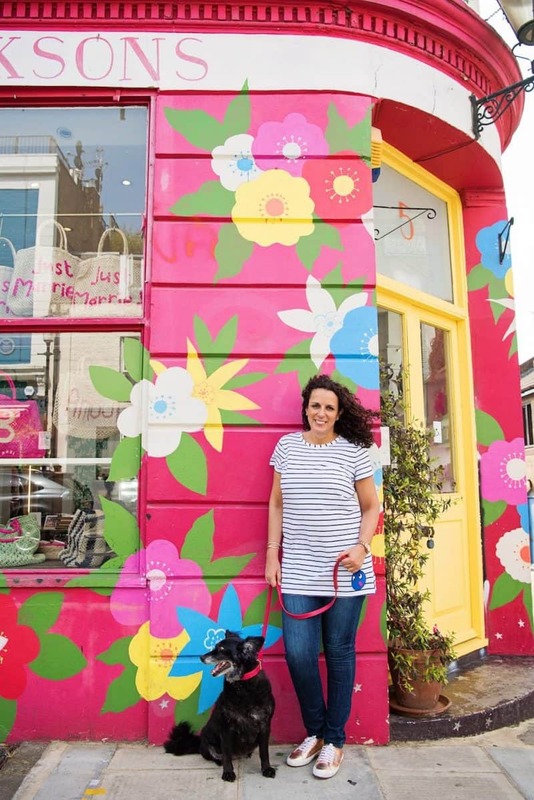 In addition, the celebrated dog nutritionist, behaviourist, columnist and radio/tv personality, Anna Webb will be helping launch the menu at Shane’s and answering any doggy related questions; joined by dog photographer, Virginie Petorin, who will be taking photo portraits of your furry friends in her pop up studio throughout the day. The Christmas Pug Cafe is coming to London for a very merry Pugmas! It’s our second visit to the city, and Pug Cafe are excited to invite pugs, pug crosses, and their humans to visit our cosey Christmas Pug Cafe at Central Street Cafe on Sunday 17th December 2017. 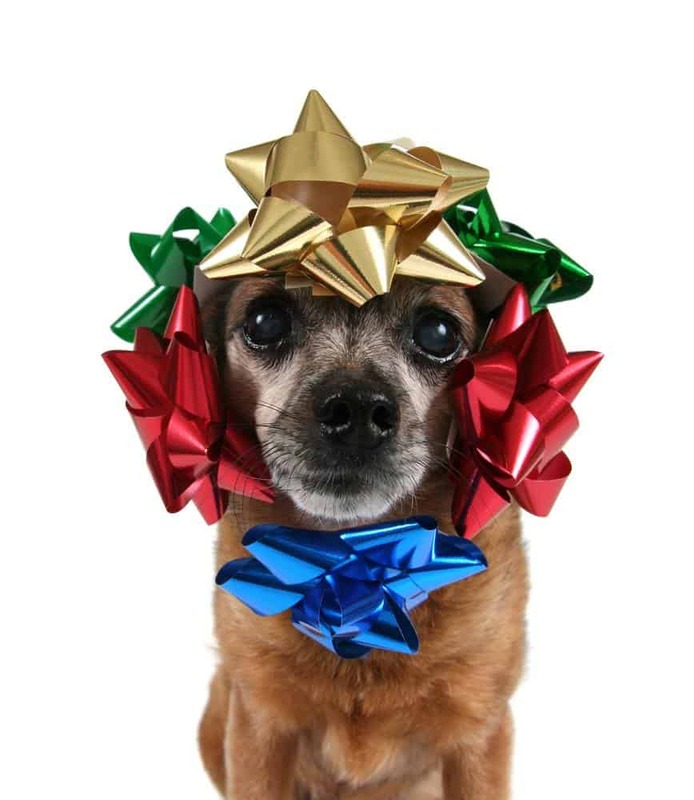 If you have a pug or pug cross make sure you treat them to a very special Christmas present and book them a visit to Pug Cafe! You’ll be able to treat your pug to a super impressive range of delicious doggy treats. 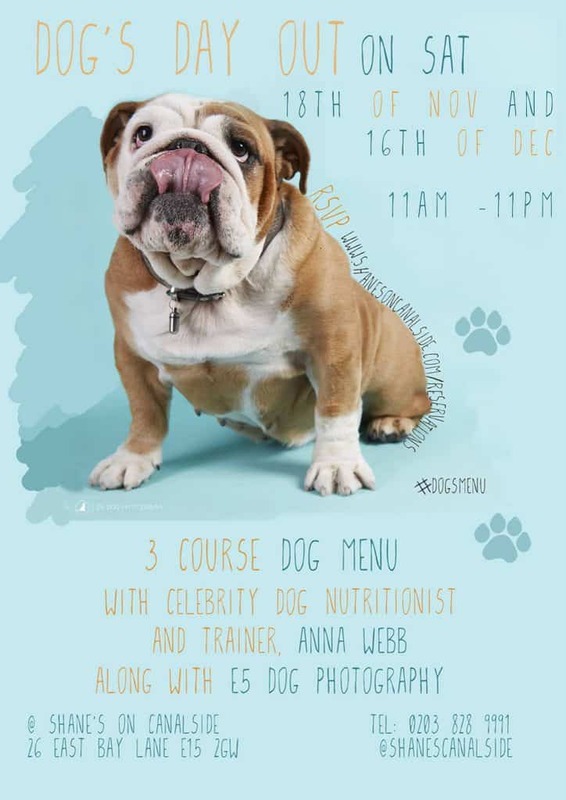 There will be a whole menu dedicated to our furry friends which will include lots of festive treats including Mince Pug Pies, Dognuts, Pupcakes, Christmas Pudding Cookies and more. Our menu for pugs is proudly brought to you by Rudi’s Doggy Bakery. Plus every pug will receive one of our FREE PUGUCCINOS! Humans you can enjoy the brilliant menu at Central Street Cafe where there will be plenty of cakes, seasonal drinks and festive dishes for you to tuck into to. Central Street Cafe is a wonderfully cute and cosey venue with delicious range of teas and coffees too. Booking opens on Saturday 18th November at 11am! 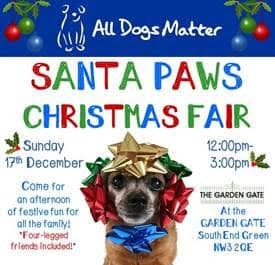 An afternoon of Festive Fun for you and your four-legged friend in aid of London Rescue & Rehoming Charity All Dogs Matter. After having to sadly cancel our event last weekend, we have decided to re-arrange it for this coming weekend 17th December! We will be back at the Garden Gate, with our stallholders, mulled wine, minced pies and more! Please contact Head Office with any questions, email info@alldogsmatter.co.uk Thank You! 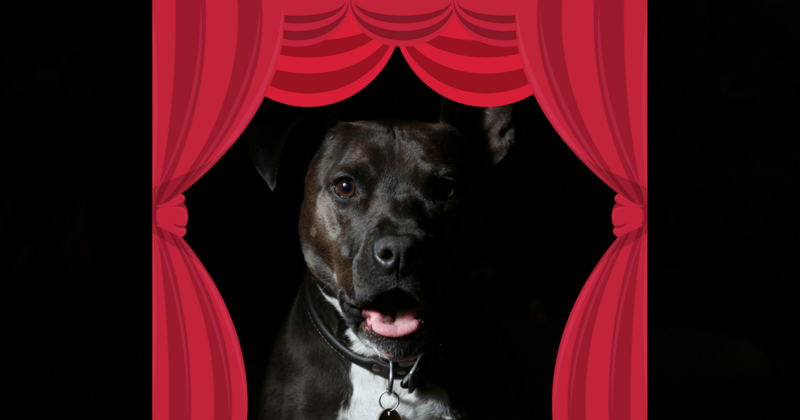 A night for local dog owners to meet (we are limiting it to 20 woofers) at The London Theatre. Abba our theatre dog will be manning the bar, it will be chaos but fun. Dogs can run around off lead and we have a garden area for poo poo and lots of doggy treats. Tickets: £2 which goes to The Doodle Trust. The ticket price is per dog, feel free to bring as many people as you want. Cheap theatre bar! You don’t even need a dog to come along, just like them and be prepared to give lots of cuddles. from 6pm to 10pm. Front gate locked so dogs can roam outside freely. Just call the theatre on 0208 694 1888 to be let in. Pre booking a must if bringing a dog! Only one dog allowed per booking. Free entry for people. Sorry no children under 14 at this event and must be with an adult. We will be selling bottles of ‘The Dog’s Bollo*cks’ doggy beer 100% doggy safe, no alcohol and made from barley, beef and kale and you might want to take a few bottle home. Text supplied by the event organiser. From Boxing Day, our four-legged family members will be in for a real treat, as dogs are welcomed in to the garden at Ham House for the first time in over 300 years. A nine week trial at the riverside mansion near Richmond will start with the Twelve Dogs of Christmas, (until 6 January 2018). During this time each new canine guest will receive the gift of a Ham bone. The first dogs of the day will also have the chance to be included as part of our Twelve Dogs of Christmas display, with each of the Twelve Dogs of Christmas winning a prize. 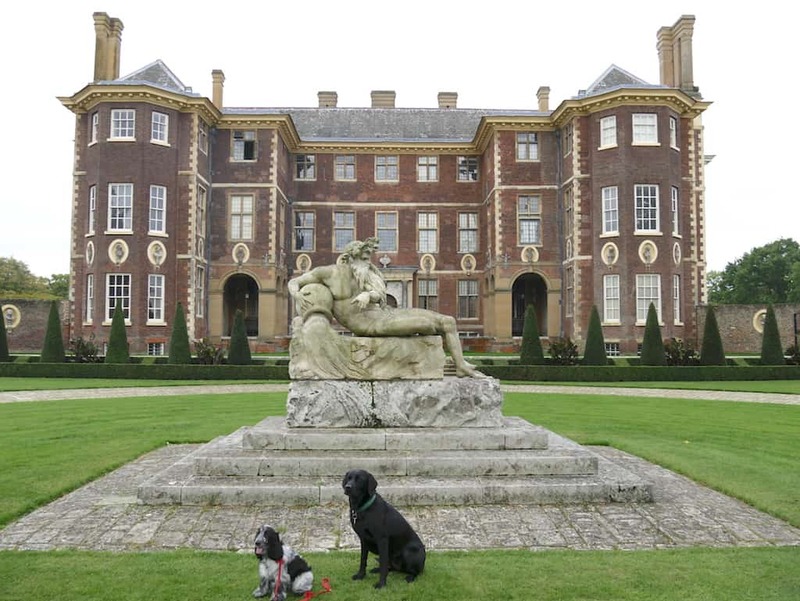 There are also three new local walks, specially created to help dog owners enjoy in the area around Ham House and Garden, which are available online and onsite. Winter Walkies at Ham House, which lasts until Friday 9 February 2018, will allow the team at Ham House to assess the conservational impact of welcoming our four-legged friends, but also allow them to better understand how we can give visitors the best possible experience. By learning more about who uses Ham House and Garden, and why, we can ensure this special place is treasured forever, and exists for everyone. Results of the Winter Walkies at Ham House trial will be published by mid-March. Two dogs per adult, dogs should be kept on a lead during their visit. Due to popular demand we welcome back our THIRD annual Christmas Dog Jumper Competition at The Windmill! Do you think your pooch has the perfect Christmas Jumper to win first place in our annual competition? Then enter our competition to see if you can take the crown from last years winner, Oscar the Weimaraner. Entry fee is £3 per pup and all proceeds go to our favourite local charity, Battersea Dogs and Cats Home. Max’s favourite shop, Woof to Kitty’s, have generously donating some fantastic goody bags for 1st, 2nd and 3rd place. A dog ain’t just for Christmas, its for NYE too! We are celebrating NYE within our Arches of Dreams for another year! This year we have doubled our size and have 3 Arches, so much more room for you to have a boogie and a chin wag! We’ve got room to swing a toy tiger! Plus Arch 3 will be turned into your Doggie chill out area, so you can party with your dog, and we will be supplying doggie treats. Pop round early for chats and eats! And at about 8pm we will be moving most of the furniture outside, so you’s can have a good dance in Arch 1. The Grandkids will be playing 70s Disco, 80s Hits and 90s Anthems all night long till 2am! Fully stocked bar featuring Teapot Cocktails and Cocktails in Vases. 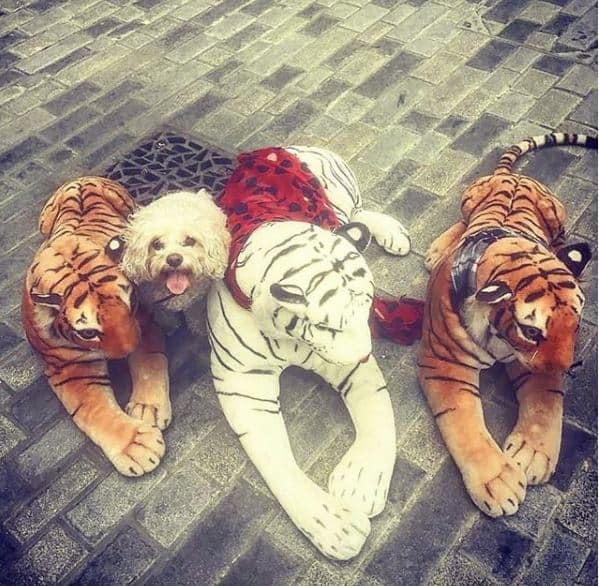 Real Dogs & Toy Tiger allowed! Come on your own, or bring ya Dog, treat ya Nan or party on with a group of mates… We got NYE sorted for you! We hope you enjoyed our December 2017 Events Agenda For London Dogs! Don’t forget to check out our What’s On Woofs Calendar for more London Dog Events each month. And if you have a London Dog Event you’d like us to woof about, give us a bark and we’ll add it to the list. Previous Post Have You Heard? Freshpet Food Has Arrived To The UK + Giveaway!